The Pedestal Magazine does not accept previously published work, unless specifically requested; however, we will accept simultaneous submissions, if so noted. Please inform us immediately if your submission is accepted elsewhere. Also, we do not accept submissions by regular mail. Neither do we accept email submissions. We now accept all work through Submittable.com. Please do not submit more than once per reading cycle. The editors will be receiving submissions of poetry for the June 2016 issue of Pedestal. No restrictions on genre, length, theme, or style. Submit up to five (5) poems in a single file. Open for submissions May 2 - May 29. Payment: $40 per accepted poem. Bruce Boston and Marge Simon will be editing speculative poetry for the December 2016 issue of Pedestal. Speculative includes science fiction, fantasy, supernatural horror, science, surrealism, and experimental. Please do not submit poems that do not fall into one of these categories. Send up to three poems in a single file (doc, docx, no pdfs). Do not submit again for this issue unless you are asked to. Open for submissions November 1- November 30. To get a sense of what we are looking for, see Pedestal #70, 2012, Pedestal #74, 2014, and Pedestal #76 in our archives. Studs Terkel's 1974 classic Working is 42 years old this year. For the June 2016 issue of Pedestal, the editors will be considering flash fiction that pertains to the working life and jobs—where so many of us spend the bulk of our lives. We are particularly interested in stories that capture the nature of the 21st Century workplace. As always, we are on the lookout for imagistic writing, strong characterization, and satirical wit. Submit up to three (3) pieces in a single file. Each piece should not exceed 1000 words. Open for submissions May 2 - May 29. Payment: 2.5 cents per word. The Pedestal Magazine publishes reviews of full-length poetry collections (we are no longer able to review chapbooks), short-story collections, novels, and various works of non-fiction. Most of our reviews are handled in-house by staff reviewers. If you are interested in submitting a title for possible review, or would like to review a specific title, please query at pedmagazine@carolina.rr.com. As mentioned above, The Pedestal Magazine does not accept previously published material, unless specifically requested. It asks for first rights to any piece its editors select. At the time of publication, all rights revert back to the author/artist; however, The Pedestal Magazine retains the right to publish the piece(s) in any subsequent issue or anthology, whether in print or online, without additional payment. Should you decide to republish the piece elsewhere, we ask that you cite The Pedestal Magazine as a place of previous publication and provide The Pedestal Magazine's web address. We do our best to respond to submissions in 4-8 weeks. Please do not query regarding status of a submission until at least eight weeks have passed. All questions pertaining to submissions should be addressed to the editor at pedmagazine@carolina.rr.com. 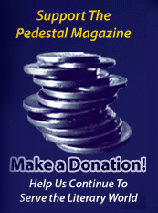 Thank you for your interest in The Pedestal Magazine. To submit, please click here (submissions are currently closed).